Ryanair will grow its passengers at Stansted to over 20 million a year in an expansion that could create 7,000 jobs at the airport. DUBLIN AIRPORT HAS lost out on major investment after Ryanair chose Stansted airport for a major growth surge. The expansion will create an estimated 7,000 new jobs at the greater London hub and lead to passenger growth of 50 per cent. 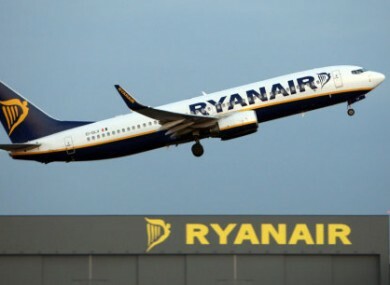 Ryanair say that the airline has agreed with Stansted’s operators Manchester Airport Group to grow its traffic by over 50 per cent from 13.2 million passengers to over 20 million in return for “lower costs and more efficient facilities at Stansted”. The passenger increase represents growth of over 50 per cent and will be achieved over the course of the next ten years according to Ryanair. The intensive growth at Stansted will account for up to 25 per cent of Ryanair’s total growth over the next five years. The decision to undergo a major expansion of services at Stansted represents a blow to the Dublin Airport Authority who welcomed new chief executive Kevin Toland on board earlier this year. Ryanair chief executive Michael O’Leary said that the decision to increase traffic at Stansted is a testament to how it has improved since being sold by BAA which owns Heathrow. This agreement, which will create over 7000 new jobs in Stansted, proves how UK airports can flourish when released from the dead hand of the BAA monopoly and is the first dramatic initiative by MAG to reverse 7 years of decline, during which Stansted’s traffic fell from 23.8 million to 17.5 million. Email “Ryanair chooses Stansted over Dublin for major growth surge”. Feedback on “Ryanair chooses Stansted over Dublin for major growth surge”.